cat beds on the market here for you to check out. Learn about their features and why they are better than other choices. Cats are very popular pets among people across the United States. Making sure that your cat has what it needs to be comfortable is a top priority among cat owners. One of the most common items a pet owner purchases for their cat is a cat bed. This is where they can go to rest and take refuge away from the hustle and bustle of the household. Cats are notorious for needing time away from children and other pets. A well placed and good quality cat bed will give them that peace and make them a better and happier pet. There is a huge range of cat beds a cat owner can choose from. Trying to decide which one will be the best for your cat could feel like a daunting task if you don’t know what features to look for. The top rated cat beds we have featured here are very popular with cat owners and we’ll share the reasons why with you. Well show you the benefits each of these beds offer and what options you have as well when it comes to picking a cat bed for your cherished feline fur kid. This wonderfully comfortable bed from K & H will be the perfect place for your c at to hide out and get away from other members of the family while it sleeps. Inside the bed there is a one piece pillow and fleece that provides as much comfort as it does style. You can use this bed all year long thanks to the heater that you can use in the winter time and remove in the spring or summer. Remove the cover to toss it in the wash and keep it as good as new. The heater of this bed warms the entire surface to make it about 10-15 degrees warmer than the ambient air temperature. Cats love to lie where it is warm and they don’t particularly like being cold which is why you may have noticed them lying in front of the refrigerator at times where warm air blows out. With this terrific and comfortable cat bed, they can lie in their bed and keep toasty even when it’s cooler in the room. The heater only uses 4 watts of power. This deluxe K & H cat bed is much like the original and popular Thermo-kitty bed but it has a zip off hood that the original doesn’t have. This hood caters to a cat’s enjoyment of being in enclosed spaces which feel much more cozy and safe for them. Clean your cat’s bed easily by unzipping the zipper on the sleep surface and unzipping the zipper on the bottom and removing the foam walls. Toss the entire thing, minus the walls, in the washed on gentle cycle, cold water. You can use a mild detergent as well. You can either line dry it when it is washed or dry it on a no heat cycle, but do not use heat from the dryer to dry it or it will shrink. The heater and foam walls should never be left in during washing or it will be ruined. Measurements are 16” in diameter with 6” high walls and it is available in two color choices. This wonderful cat bed comes with a one year limited warranty as well. It has a 5.5’ electrical cord that you will need to ensure is not where the cat can get tangled up in it. 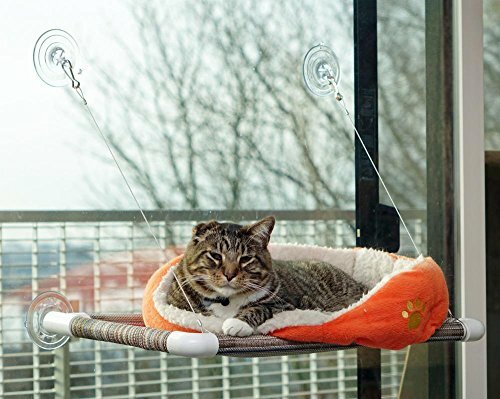 This unique design makes a perfect cat bed for the cat that loves to look out the window or sleep on the window sill. The patented Giant Suction Cups are made in the USA and each cup is rated to hold 15 pounds. This comfortable Kitty Cot is 26” long and 14” wide and will safely hold up to 30 pounds. The frame of this Kitty Cot bed/perch is made from durable plastic pipe with a hammock made from weather resistant fabric. You can take the Kitty Cot down at any time to clean it and it can go on any window at any height your cat likes. It is recommended by the company to mount Kitty Cot on double paned windows and not single paned since double pane windows are much stronger and can hold the weight safely. If you find your cats in the window all the time, you can be confident that they are going to love the Kitty Cot. Put it in the front window of your home where they can watch outside birds, squirrels and people go about their days. It is good for both older cats and kittens. To make it even more appealing you can lay your cat’s blanket on top of the Kitty Cot for maximum comfort. No tools are needed to install the Kitty Cot and it has been approved by the Humane Society. The support cables are made of 1/8” stainless steel and will never wear out. This is a great cat bed that your cat will appreciate for years to come. Since suction cups can come loose from the glass on occasion, so it is very important that you check the suction on each cup and make sure that they are securely attached. If they have excessive wear, be sure to replace them to ensure the continued safety of your cat while he is on the bed. Armarkat is a well known leading pet product company that produces good quality products for dogs and cats. 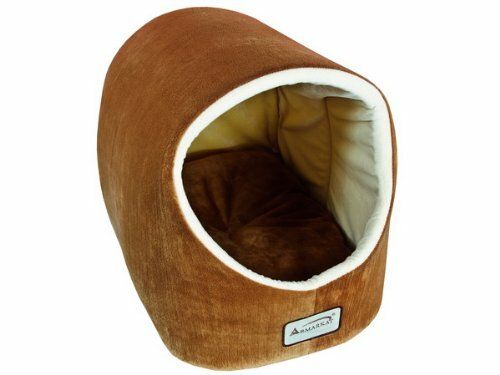 The Cave shape cat bed is a bed that your cat will love due to its unique shape that gives the cat a place to “hide” and be out of eyesight of young children and other pets. Cats are very independent and sometimes they want to get away and not be right in the fray. 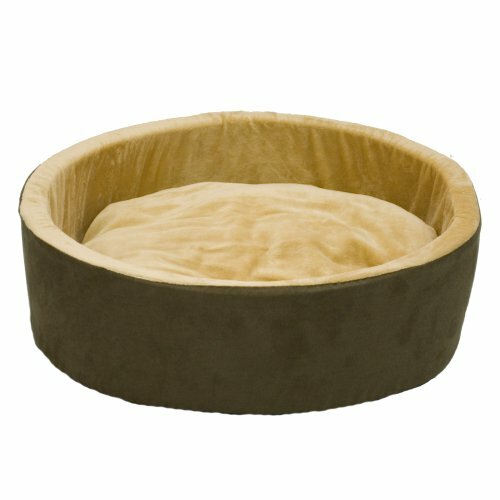 The Armarkat Cave Shape Cat Bed is covered in soft velvet and has a waterproof and skid-free base. It has an extra thick 100% poly fill to provide your cat with the most comfort. The dimensions of this comfortable cat bed are 18” x 13” x 13”. It is machine washable to keep it look good as new. The brown and ivory coloring is neutral enough to look good in any room. You cat will love the cave like feel and will probably spend time in there even when it is not sleeping. If you are familiar with cats you know that they are lovers of smaller spaces so don’t think the cave shape is too enclosed for them that is what they like and prefer. The Armarkat cat bed is good for older cats and kittens too and can be placed anywhere you know your cat likes to sleep. Don’t isolate them too much, but don’t out the bed in a high profile, high traffic area or they may not want to use it. All three of these top rated cat beds will provide hours of peace and quiet for your cherished cat. Each has a unique design that your cat will love. Whether they like to lie in the window or crawl into enclosed spaces, one of these three top rated cat beds will be a great choice for any pet owner who wants to provide their cat with a comfortable place to sleep and rest. Keep reading below to learn even more about choosing the right cat bed for your cat. With all of the many choices available on the market, we want to make that choice easier for consumers by providing information that will help you narrow down your choices and decide which cat bed fits yours and your cat’s needs the best. You may not realize that your cat would even like a cat bed, but if you provide a cat bed that is in a design or shape that you know your cat enjoys, such as enclosed spaces, or that is heated, they will love their cat bed and spend a lot of time there. Cats will climb and sleep wherever they feel like and that will include in boxes, on your clothes, on your furniture and anywhere else the mood strikes them, including in many cases right onto of YOU! If you want to provide your cat with its own special sleeping spot, you will find the right information on what to look for, potential shapes and styles available and even how to get your cat to love their new, special bed in this buyer’s guide. There are several things to consider when purchasing a bed for your cat. Comfort and safety is what you want to focus on when you are shopping but there are some questions that you may want to ask yourself before you look that will help you narrow down the choices and figure out which is the perfect cat bed for your cat that they will use and love for a long time to come. You want your cat to feel comfortable in its bed so it is important to find one that has components that your cat already naturally is drawn to. For example, if your cat is always looking for warm spots to sleep in, you will want to find a cat bed that has a heater. Make sure the heater is removable so they do not become overheated in warmer months. If they love to climb, look for cat beds that can work in higher places. If you choose a style based on traits that your cat displays, it will not be difficult to get them to enjoy sleeping in their new bed. There are many different styles of cat beds on the market. We’ve listed several of the more popular styles that cat owners and their cats love. Enclosed Cat Bed – This type of bed is considered one of the best cat beds you can get. The pod like design caters to a cat’s love of enclosed, small spaces. There are many different shapes and variations of this style but the main specifications will all be similar; a smaller opening and soft, comfortable interior. Sometimes enclosed cat beds have removable heaters which makes them a perfect choice for cold winter months. Radiator Cat Bed – A radiator cat bed has a heater underneath it that provides your cat with plenty of warmth. The heater is covered by fabric that protects the animal from getting burned. In the summertime, there is usually no need for the bed to be heated, so it is best to remove the heater and put it somewhere safe until the months are colder again. Basket Beds – Basket beds are perfect for summertime. It is open and usually has a comfortable and cushioned pad or mattress inside. There is plenty of airflow that surrounds this bed which makes it perfect for hot summer days where sleeping can be a problem due to the heat. A basket bed will need to be cleaned more often since it is open to dust and dirt from the household. There are many features to look for when it comes to finding the perfect cat bed for your cat. These features will make your choice one that will please your cat and get a lot of use as well. Easy to Clean – Even though cats are much cleaner than dogs, they still walk in and out of their cat litter pans and can still get dirty. Having a cat bed that is easy to clean ensures that the bed remains in good condition and stays a place that your cat will want to be. Removable covers, removable pads and more are things you want to look for. In most cases these things are machine washable but you will need to either line dry them or dry in the dryer on a NO heat cycle. Comfortable Fabric – The material used for the covering of your cat bed will determine whether your cat will enjoy sleeping on it. Common fabrics used to cover a cat bed include velvet, cotton, fleece and denim. All of these materials are washable and comfortable as well. Machine Washable – Never get a cat bed that is not machine-washable. Even though cats are not as dirty as dogs, they do still get dirty and you want to be able to remove the covering so you can toss it into the washer. Not Too Big – Cats love smaller, enclosed spaces so look for cat beds that give them this sense of coziness and hiding. Many of the cat beds available have pod like looks to them with a small opening and larger inside. As long as your cat can get in and out of the pod like bed easily and without pain, they will love the cave like feel. Cats do not typically like wide open beds like a dog would so keep the size and shape more in line with the pod like design or at the very least s design that gives them a sense of protection from the rest of the household. Don’t put your cat’s new bed in a high traffic, noisy area. On the other hand, don’t put it in a room that no one goes into either. Cats want to be social when they want to be, so providing them with a bed that is in a fairly social place but not overly busy will be a good compromise. Cat’s like higher elevation, so if you can, put their bed up higher such as on a shelf or top of a cupboard. Pay attention to where they have been sleeping and put their new bed in that favored spot. You can’t force or punish your cat into sleeping in their new cat bed. If you purchase one and the cat doesn’t seem interested, see if there are some things you can do to peak their interest. Here are some suggestions. Try putting a few pieces of old clothing in the bed to give it the smell of you, their owner, rather than something they don’t recognize. Put some of their recognized and favorite cat toys in the bed. Never yell at or force them into the bed. This is a one way ticket to having them never want to use it. Be patient…if you make the bed smell right and out it in a favored location, they will eventually use it and love it as much as you hoped they would. Cats sleep a lot, two times as much as humans so finding a great bed for them to spend all that time in is a natural desire for a cat owner. With the information you have learned here, you can confidently choose a cat bed that will fit your cat’s personality and preferences and reduce the amount of cat hair and dander on your belongings and bed. Cats may be finicky but they love new things, so chances are if you take the information in this buyer’s guide and use it when choosing your cat’s bed, you will find them happy to explore and check out their new bed.